American hip hop star Big Boi, one half of the popular group Outkast, delivered a spirited and enthusiastic performance before thousands of music lovers at the recent conclusion of the 11th Edition of the St. Kitts Music Festival. High energy acts and top quality music were a constant throughout the June 21 to 23 summer party as popular regional and international recording artistes such as Michael Bolton, Ne-Yo, Lady Saw, Sean Paul and Maxi Priest were well received by fans. Local talents including King Konris, Queen Anastasia, Jazzique Chiverton and Carnival 2006-2007 Road March Champions the Small Axe Band also performed brilliantly. SKNIS spoke to several fans who could hardly contain their excitement. ?It is amazing,? raved Valerie and Gina from the United States who were attending the Festival for the first time. ?We like it here. We get warm faces (from the audience) and see familiar faces (from the popular artistes) but you still get all the glitz and the glamour and the light and the energy. It is simply amazing,? said Valerie. Daisy from Cayon, St. Kitts attends the event every year. She explained that she was a huge fan of Michael Bolton and firmly believes that the show gets better every year. SKNIS also interviewed a young man who came to St. Kitts for the 2007 Cricket World Cup in March and returned with 11 friends for the festival. Dominic Samuels from Melbourne, Australia and his girlfriend brought several friends with them to enjoy the island they have come to love. ?It?s been fantastic,? he noted. ?I?ve had a great time. 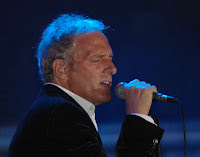 Sean Paul was great last night and Michael Bolton has been awesome tonight.? The Australian stressed that he had wonderful experiences during both visits and promised to continue spreading the word about the twin island Federation. 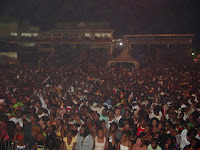 Organisers are reportedly pleased with the overall staging of the 2007 St. Kitts Music Festival. Reports suggest that planning for the 2008 edition has already begun. The three-night event was staged at the Warner Park Stadium. Additional opinions can be heard on SKNIS Perspectives, which will also feature a review of the Festival with Chairman Faron Lawrence and clips from the final night of the show.